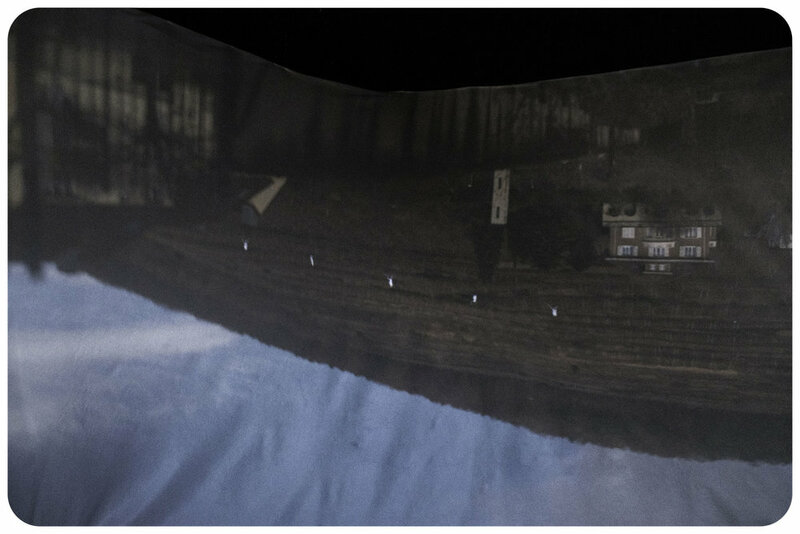 The camera obscura is a natural optical phenomenon whereby an inverted and mirrored image of the outside view is projected inside a darkened space when light is allowed to pass through a small hole. Stepping into a dark room, it takes your eyes a few minutes to adjust to the low light with the image slowly appearing more detailed over time. From the very first day of my residency at Les Dominicans, there were two things that caught my attention – the quality of light, and the rolling vineyards of Kitterlé forming the backdrop of Guebwiller. For the first few weeks its presence was something I was acutely aware of, but slowly this towering figure receded into the background of my visual experience. Time it seems had altered the perception of my surroundings; just as it had changed the way we understand our relationship with the natural environment. For centuries it has formed the backdrop for humanity, but as we are now officially considered a geological factor in the earth’s ecosystem, it has emerged into the foreground dissolving the ideological and physical boundaries between humans and nature. The dilemma however today is that as we try to adapt to our fragile environment, a new ‘natural’ state of existence is being formed by technology without us even being completely aware of it. By tracing the evolution of optics as a source of inspiration for man-made technologies, we see that its purpose has shifted away from studying reality to altering reality altogether. Does this suggest that perhaps we would one-day wake up to find our environment completely framed within a new reality? At this point, would it matter where the real (natural) ends and the virtual (artificial) begins? As a response to this, I use the properties of a camera obscura to transport the Kitterlé away from its natural habitat and reframe it within a custom built garden house. Adding to the naturally formed image of the vineyard, a single-channel video projection with sound is used to create a subtle interplay between these elements to explore the boundaries between the old and new, natural and digital.